To Cite: Pouyan F, Akbari Kamrani M, Rahimzadeh M, Jamshidimanesh M, Esmaelzadeh–Saeieh S . Effect of Interpersonal Psychotherapy Oriented Child Birth Education on Stress and Role Adaptation in Mothers with Premature Birth: A Randomized Clinical Trial, Iran J Psychiatry Behav Sci. 2019 ; 13(1):e86645. doi: 10.5812/ijpbs.86645. Background: Preterm labor is the most stressful experience for mothers. Consultation by interpersonal psychotherapy (IPT) approach is a method to support mothers with pre-term labor. This study aimed to assess the effect of IPT oriented child birth education on adaption role and stress in mothers of infants admitted to the intensive care unit. Methods: This randomized interventional study investigated 92 primiparous women with a newborn admitted to the newborn intensive care unit of Kamali Hospital. The sampling method was convenient and samples were randomly assigned to two groups of control and intervention by four blocks randomization method. In addition to routine care, the intervention group received three IPT counseling sessions. The data collection tool in this study was parental stress questionnaire and maternal role adaptation questionnaire. Results: The results of repeated measure test indicated that the maternal stress score had a significant change over time (P < 0.001) with significant differences between the two groups (P < 0.001), and maternal role adaptation changed significantly over time (P < 0.001) with a significant difference between the two groups (P < 0.001). Conclusions: Considering the impact of interpersonal psychotherapy-oriented child birth education on maternal stress and maternal role adaptation, as well as the limited duration and cost of this program and the possibility of training it by nurses and midwives, it is suggested to include this training program in routine interventions for mothers with a premature baby. Pregnancy, delivery, and the process of motherhood are sensitive and complex periods and one of the most important events in a women’s life (1, 2). According to Rubin’s belief, maternal experience includes evolution of behaviors that lead to appropriate adaptation to the maternal role. Maternal experience begins from pregnancy and lasts until a few months after childbirth; the associated obvious physical, social, and psychological changes affect the mother’s mental health and all other aspects of her personal and family life (3). Birth is an unpredictable event and women tolerate more stress by lack of knowledge about the health of their baby (4). Preterm infants cause dissatisfaction in mothers due to being different from other infants and thus endanger mothers’ mental health (5). Following advances in the recent years in perinatology and neonatal intensive care, the level of care for these infants has increased (6, 7). According to statistics, about 8% to 10% of hospitalized neonates require admission to the neonatal intensive care unit (NICU) (8). According to the Iranian Ministry of Health, among 1200000 newborns born annually, the prevalence of preterm infants ranges from 5.6% to 39.4% in different studies of the country (7). A study showed that 7.2% of all births were premature (9). The birth of a premature neonate, who needs special care and admission to NICU causes parents to experience some degree of stress (10, 11). The most important parental needs of infants admitted to the NICU are communicational and informational needs (12). There are many training programs for mothers with preterm infants, most of them focus on neonatal care. Based on studies addressing the educational needs of mothers with infants admitted to NICU, mothers, in addition to neonatal care education, also need to learn about interactions between them and the neonate, such as understanding the neonate’s behavior and signals (13). One of the supportive methods for these mothers can be education based on the interpersonal psychotherapeutic approach (IPT), a short-term education that focuses on communicational problems in relationships with people and better utilization of social support during crisis (14). The IPT is used for different age groups and is provided by psychiatrists and non-physicians, including midwives, nurses, and non-professionals (15). Many studies have shown that IPT-based training can improve the mental health of mothers after childbirth (16). The results of a study showed that parental competence in primiparous mothers decreases during the postpartum period compared to pregnancy (17). Therefore, considering the population of mothers in the reproductive age and prevalence of preterm labor in this province, it is necessary to consider an intervention to reduce stress and improve maternal adaption in mothers with premature newborns. This study was a randomized interventional study and registered at the Iranian registry of clinical trials (IRCT2017022520719N5) with Abzums.Rec.1395.152 ethical code. Participants in this research included all primiparous mothers with neonate admitted to NICU in Kamali hospital, Alborz, which is the most commonly visited hospital with NICU and all mothers with preterm labor were referred to this hospital in this province. Alborz is one of the provinces in the central part of Iran. The province has a population of over 5.2 million. According to the study of Alkouzi et al., with the probability of type 1 error of 0.05 and power of 80%, the sample size with using the following formula was considered 46 in each group (18). In the intervention group, two participants were excluded from the study due to their absence from one training session and in the control group, three participants were excluded due to their reluctance to continue participating in the study. Finally, 44 patients in the intervention group and 43 in the control group were investigated (Figure 1). Research analysis was based on a pre-protocol analysis. The inclusion criteria of this study included: Being Iranian, fluent in Persian, first pregnancy, wanted pregnancy, gestational age of 28 to 34 weeks, having a neonate without anomaly and singleton pregnancy. The exclusion criteria were as follows: Absence of mother in one training session, any complications of pregnancy (diabetes, preeclampsia, etc. ), and medical or psychological problems mentioned by mothers. The researcher was a postgraduate student in midwifery counseling, who had the necessary training in IPT. After obtaining permission from the authorities, the researcher referred to the study center every day and after explaining the research objectives and obtaining oral and written consent, samples were randomly assigned to four random blocks and divided to two groups, receiving counseling (intervention) and routine care (control). There were six possibilities for blocks (BABA, BBAA, ABBA, AABB, ABAB, and BAAB). At the beginning of the study, one block was selected and four participants were assigned to that block, so that A was assigned to the intervention group and B to the control group. After determining the groups and before starting the study in both groups, the scores of maternal role adaptation and parental stress were determined using the parental stress questionnaire (PSS: NICU) and maternal role adaptation questionnaire. In this research, the data collection tools consisted of three parts: demographic characteristics, maternal role adaptation scale, and parental stress questionnaires. Maternal role adaptation scale in mothers of premature infants had 32 items and six subscales (self-efficacy, growth and development, uncertainty, participation in care, and distance motherhood). This scale was designed by Heydarpour in 2016 (19). Parental stress questionnaire for NICU infants (PSS-NICU) developed by Miles et al. includes three dimensions (sights and sounds of NICU, neonate’s behavior and appearance, parental roles, and communication with the infant and unit’s staff). The design of this tool is based on a six-point Likert scale (20). This questionnaire was validated by Valizadeh et al. in Iran (21). Before, after, and two weeks after the intervention, PSS-NICU and maternal role adaptation scores were analyzed. The intervention group received two consecutive 60-minute training sessions and one follow-up session by a telephone call after discharge from the hospital, according to the study of GAO et al. and based on the IPT approach (14). Session 1 included descriptions of the study objectives, necessary care for premature neonate, neonatal development, talking about mothers’ concerns and problems, providing information on maternal roles, barriers to communication with the neonate, barriers to facilitating the communication with the neonate, issues related to neonate’s gender, postpartum depression symptoms, and strategies to adapt to the stress. The second session included providing information on how to expand and improve social counseling, identifying and coping with personal conflicts, teaching problem-solving skills, and training and improving communication skills with the newborn after birth. The third session included individual training and post-discharge follow-up by a telephone, which included tracking the trained skills, counseling about the problems encountered after leaving the hospital, and concerns about adoption with the maternal role and emphasis on support from others. In order to meet the ethical principles in this research, the participants of the control group received a handbook on a given training after the end of the study. Table 1 shows the demographic characteristics of mothers with premature infants. There was no statistically significant difference in demographic characteristics between the control and the intervention groups, except for the spouse’s job (Table 1). The effect of spouse’s job variable was included in the model and the results showed that it had no effect on parental stress (P = 0.76) and maternal competence (P = 0.83) (Tables 2 and 3). aValues are expressed as No. (%) or mean ± SD. The results of repeated measure test showed that parental stress of the three time had differed significantly (P < 0.001) and a significant difference was shown between the two groups (P < 0.001). Therefore, interpersonal training had a significant effect on parental stress in the intervention group (Table 2). The results of repeated measure test showed that maternal role of before, after, and two weeks after the intervention t differed significantly (P < 0.001) and significant difference was shown between the two groups (P < 0.001). Therefore, interpersonal counseling had a significant effect on maternal role adaptation in the intervention group (Table 3). The results of this study showed that IPT training is effective on maternal stress and adoption. Parents of premature infants are more exposed to stress associated with physical appearance, infant’s condition, and parenting problems (22). Increased parental stress can lead to behavioral problems in mothers. Interpersonal psychotherapeutic approach, with correction of the relationship, shows positive and negative aspects to the person to reduce stress (23). The IPT helps mothers identify their problems and by presenting a therapeutic contract, leads to changing stressful behaviors of the person and improves their mental health (24). Another study showed the effect of IPT on decrease of depression, anxiety, and cortisol level during pregnancy (25). The results of this study showed that IPT increased adoption score in the intervention group. Motherhood is a woman’s greatest change, and women endure most challenges in this period in order to obtain this transition (16). Mothers, who have premature infants face many difficulties in the process of adaptation to a maternal role (26). One study showed that women, who give birth to healthy infants have a higher score of adaptation to their maternal role and child health is effective on adaptation to maternal roles. A study showed that the neonatal behavior can cause maternal stress, which causes loss of maternal competence (27). The interaction between the mother and neonate is usually the most important factor in growth and development of premature infants (28). Mothers of premature infants are at risk of developing attachment problems and reduced responsiveness to the neonate. Preterm infants look less to their care-giver and respond less to sounds than other infants (29). Therefore, weakness in parent-child behaviors and relationships can lead to decreased interpersonal relationships in mothers, while IPT can lead to the formation of role transition and improves self-efficacy (personal judgment of one’s own ability to cope in a specific situation) (30) by increasing the mother-child’s attachment and adoption of the mother’s role (23). One study showed the effect of IPT on parental competence and social support of primiparous women and identified better interpersonal communication as a factor for emotional support of mothers and empowered them in taking care of the infant and home responsibilities (16). Previous studies reported the effect of IPT in the short term (31). However, other studies have also shown the effect of psychotherapy on reducing postpartum depression and improving mental health of mothers, lasting for up to three months after childbirth (16). In this study, maternal role adaptation was measured immediately and two weeks after the intervention, and the mean score was higher two weeks after compared with immediately after the intervention, which may have been due to the support of others, time transition, and access to other sources of information. In the control group, 90.6% and in the intervention group, 84.1% of the mothers had the support of others. A study showed that maternal competence increases in the last trimester of pregnancy up to four months postpartum (32). Mothers experience behavioral and cognitive changes and IPT helps reduce stress and accepting mother’s role, by positive thinking and encouragement for a better motherhood (14). One of the limitations of this research was the post-intervention follow-up period; it is suggested to design a study with a longer follow-up to explore the continued effect of the IPT program. It is also suggested for studies to investigate the influence of IPT with the presence of fathers of infants admitted to the NICU. Controlling the access of participants to other information sources, such as the Internet and other media was another limitation of this study. The results of this study showed the effectiveness of IPT on stress and maternal role adaptation in primiparous mothers with a newborn admitted to the NICU. Due to the short duration and low cost of this program as well as the ability to train health care providers, it is proposed to combine this program with routine interventions for mothers of infants admitted to NICU. Also, health care providers should be informed about social support and consider themselves as a source of support for mothers and enhance adaptation to maternal role transition by presenting appropriate training programs, such as IPT. The researchers acknowledge the research deputy of Alborz University of Medical Sciences for their financial support. They also appreciate Clinical Research Development Center of Kamali Hospital in Alborz province for providing counseling services. Clinical Trial Registeration Code: This study was a randomized interventional study and registered in Iranian Registry of Clinical Trials (IRCT2017022520719N5). Declaration of Interest: The authors declare that they had no conflict of interests. Patient Consent: The participants provided a written informed consent for the publication of this report. 1. Correia LL, Linhares MB. Maternal anxiety in the pre- and postnatal period: A literature review. Rev Lat Am Enfermagem. 2007;15(4):677-83. [PubMed: 17923988]. 2. Wardrop AA, Popadiuk NE. Women’s experiences with postpartum anxiety: Expectations, relationships, and sociocultural influences. Qual Rep. 2013;18(3):1-24. 3. Javadifar N, Majlesi F, Nasrabadi AN, Nedjat S, Montazeri A. Internal conflicts of Iranian first-time mothers in adaptation to maternal role. Iran J Nurs Midwifery Res. 2013;18(3):222-7. [PubMed: 23983759]. [PubMed Central: PMC3748542]. 4. Ternstrom E, Hildingsson I, Haines H, Rubertsson C. Pregnant women's thoughts when assessing fear of birth on the Fear of Birth Scale. Women Birth. 2016;29(3):e44-9. doi: 10.1016/j.wombi.2015.11.009. [PubMed: 26710973]. 5. Hawes K, McGowan E, O'Donnell M, Tucker R, Vohr B. Social emotional factors increase risk of postpartum depression in mothers of preterm infants. J Pediatr. 2016;179:61-7. doi: 10.1016/j.jpeds.2016.07.008. 6. Brett J, Staniszewska S, Newburn M, Jones N, Taylor L. A systematic mapping review of effective interventions for communicating with, supporting and providing information to parents of preterm infants. BMJ Open. 2011;1(1). e000023. doi: 10.1136/bmjopen-2010-000023. [PubMed: 22021730]. [PubMed Central: PMC3191395]. 7. Ghafoorie M, Janmohammadi S, Nariman S, Haghani H, Kabir K. The study of maternal perception of preterm infants and some related factors in selected hospitals of Iran University of Medical Sciences. Alborz Univ Med J. 2015;4(2):116-23. doi: 10.18869/acadpub.aums.4.2.116. 8. Yeo C, Ho SK, Khong K, Lau Y. Virtual visitation in the neonatal intensive care: Experience with the use of internet and telemedicine in a tertiary neonatal unit. Perm J. 2011;15(3):32-6. [PubMed: 22058667]. [PubMed Central: PMC3200097]. 9. Valizadeh L, Ajoodaniyan N, Namnabati M, Zamanzadeh V, layegh V. Nurses' viewpoint about the impact of kangaroo mother care on the mother–infant attachment. J Neonatal Nurs. 2013;19(1):38-43. doi: 10.1016/j.jnn.2012.05.004. 10. Arnold L, Sawyer A, Rabe H, Abbott J, Gyte G, Duley L, et al. Parents’ first moments with their very preterm babies: A qualitative study. BMJ Open. 2013;3(4). e002487. doi: 10.1136/bmjopen-2012-002487. 11. Karami K, Rostami S, Ghadirian F. [Effect of educational- supportive interventions on premature infants’ lentgh of hospitalization and maternal stress]. Sci Mag Yafte. 2009;11(2):67-73. Persian. 12. De Rouck S, Leys M. Information needs of parents of children admitted to a neonatal intensive care unit: A review of the literature (1990-2008). Patient Educ Couns. 2009;76(2):159-73. doi: 10.1016/j.pec.2009.01.014. [PubMed: 19321288]. 13. Ra JS, Lim J. Development and evaluation of a video discharge education program focusing on mother-infant interaction for mothers of premature infants. J Korean Acad Nurs. 2012;42(7):936-46. doi: 10.4040/jkan.2012.42.7.936. [PubMed: 23377589]. 14. Gao LL, Chan SWC, Li X, Chen S, Hao Y. 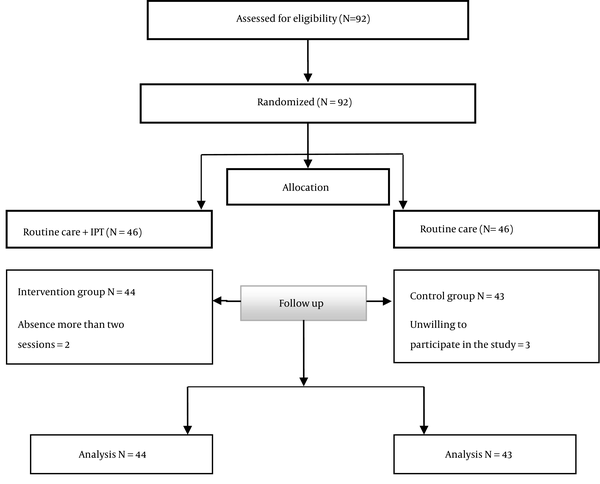 Evaluation of an interpersonal-psychotherapy-oriented childbirth education programme for Chinese first-time childbearing women: A randomised controlled trial. Int J Nurs Stud. 2010;47(10):1208-16. doi: 10.1016/j.ijnurstu.2010.03.002. 15. Weissman MM, Markowitz JC, Klerman GL. Clinician's quick guide to interpersonal psychotherapy. Oxford University Press; 2007. doi: 10.1093/med:psych/9780195309416.001.0001. 16. Gao LL, Xie W, Yang X, Chan SWC. Effects of an interpersonal-psychotherapy-oriented postnatal programme for Chinese first-time mothers: A randomized controlled trial. Int J Nurs Stud. 2015;52(1):22-9. doi: 10.1016/j.ijnurstu.2014.06.006. 17. Gao LL, Sun K, Chan SW. Social support and parenting self-efficacy among Chinese women in the perinatal period. Midwifery. 2014;30(5):532-8. doi: 10.1016/j.midw.2013.06.007. [PubMed: 23859826]. 18. Alkozei A, McMahon E, Lahav A. Stress levels and depressive symptoms in NICU mothers in the early postpartum period. J Matern Fetal Neonatal Med. 2014;27(17):1738-43. doi: 10.3109/14767058.2014.942626. [PubMed: 25005861]. 19. Heydarpour S, Keshavarz Z, Bakhtiari M, Zayeri F. Maternal role adaptation scale in neonatal intensive care units (MRAS: NICU): Development, validation and psychometric tests. Global J Health Sci. 2016;9(4):115. doi: 10.5539/gjhs.v9n4p115. 20. Miles MS, Funk SG, Carlson J. Parental stressor scale: Neonatal intensive care unit. Nurs Res. 1993;42(3):148-52. [PubMed: 8506163]. 21. Valizadeh L, Akbar Baglo M, Asadolahi M. [Effective stressors on mothers with preterm infants in neonatal intensive care unit’s of Tabriz educating hospitals]. Med J Tab Uni Med Sc. 2009;31(1):85-90. Persian. 22. Ghorbani M, Dolatian M, Shams J, Alavi-Majd H, Tavakolian S. Factors associated with posttraumatic stress disorder and its coping styles in parents of preterm and full-term infants. Glob J Health Sci. 2014;6(3):65-73. doi: 10.5539/gjhs.v6n3p65. [PubMed: 24762347]. [PubMed Central: PMC4825380]. 23. Bernecker SL, Constantino MJ, Pazzaglia AM, Ravitz P, McBride C. Patient interpersonal and cognitive changes and their relation to outcome in interpersonal psychotherapy for depression. J Clin Psychol. 2014;70(6):518-27. doi: 10.1002/jclp.22038. [PubMed: 24002972]. 24. Crowe M, Luty S. Patterns of response and non-response in interpersonal psychotherapy: A qualitative study. Psychiatry. 2005;68(4):337-49. [PubMed: 16599400]. 25. Field T, Diego M, Delgado J, Medina L. Peer support and interpersonal psychotherapy groups experienced decreased prenatal depression, anxiety and cortisol. Early Hum Dev. 2013;89(9):621-4. doi: 10.1016/j.earlhumdev.2013.04.006. [PubMed: 23727060]. [PubMed Central: PMC3742661]. 26. Ozkan H, Polat S. Maternal identity development education on maternity role attainment and my baby perception of primiparas. Asian Nurs Res (Korean Soc Nurs Sci). 2011;5(2):108-17. doi: 10.1016/S1976-1317(11)60019-4. [PubMed: 25030260]. 27. Liu CC, Chen YC, Yeh YP, Hsieh YS. Effects of maternal confidence and competence on maternal parenting stress in newborn care. J Adv Nurs. 2012;68(4):908-18. doi: 10.1111/j.1365-2648.2011.05796.x. [PubMed: 21790741]. 28. Kartner J, Keller H, Yovsi RD. Mother-infant interaction during the first 3 months: The emergence of culture-specific contingency patterns. Child Dev. 2010;81(2):540-54. doi: 10.1111/j.1467-8624.2009.01414.x. [PubMed: 20438459]. 29. Miles MS, Holditch-Davis D, Burchinal MR, Brunssen S. Maternal role attainment with medically fragile infants: Part 1. measurement and correlates during the first year of life. Res Nurs Health. 2011;34(1):20-34. doi: 10.1002/nur.20419. 30. Bandura A, Freeman W, Lightsey R. Self-efficacy: The exercise of control. Springer; 1999. 31. Miniati M, Callari A, Calugi S, Rucci P, Savino M, Mauri M, et al. Interpersonal psychotherapy for postpartum depression: A systematic review. Arch Womens Ment Health. 2014;17(4):257-68. doi: 10.1007/s00737-014-0442-7. [PubMed: 24957781]. 32. McClennan Reece S, Harkless G. Self-efficacy, stress, and parental adaptation: Applications to the care of childbearing families. J Fam Nurs. 2016;4(2):198-215. doi: 10.1177/107484079800400206.